← ANIMAL KILLING MEANS NO JUSTICE. 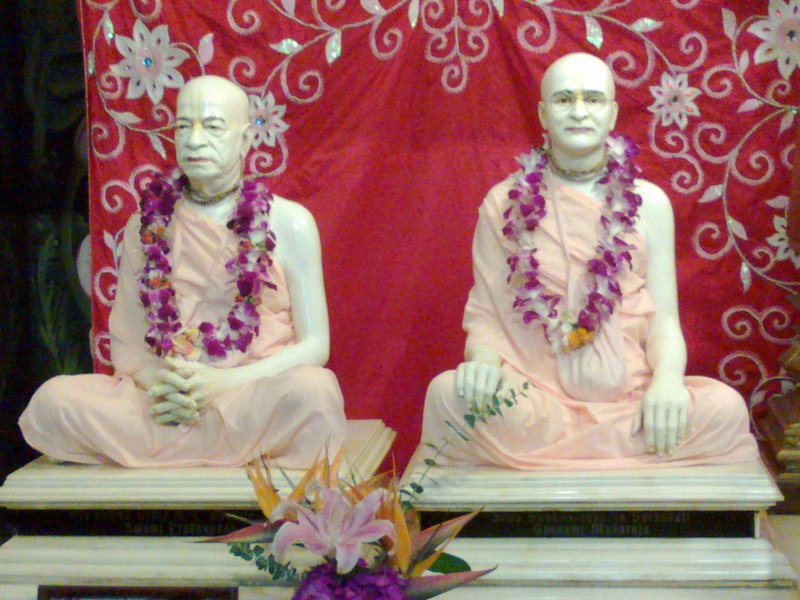 19 Aug 2014, SRILA PRABHUPADA VYASAPUJA or celebration of the Birthday Festival of the Spiritual Master. caksur unmilitam yena tasmai sri-gurave namah. Srila Prabhupada, your kind and magnanimous guidance is an ongoing process. Your books are scintillating spiritual stars that offer us constantly various bright and enlivening insights into the science of love of God. We have to assume that this sparkle and shining is uninterrupted, even though our receptivity may be graduated or intermittent. Your every single word is meant for our eternal benefit and pulls us progressively out of the baser modes of material nature. At times you feel so miserable. Please do not take Srila Prabhupada’s institution ISKCON and contribution to the global advancement of Krishna consciousness for granted. It is nothing less than is a golden path. Why don’t you instead permanently accept Srila Prabhupada’s and Lord Caitanya’s blissful program of chanting Hare Krishna Hare Krishna Krishna Krishna Hare Hare Hare Rama Hare Rama Rama Rama Hare Hare, dancing and feasting? 1. Leaving India for the first time, there will be no need for someone to take a taxing ocean trip on the Jaladuta from Kolkata to Boston at the ripe old age of 69 and suffer several heart attacks on the way. 2.There will be no need for someone to start from scratch a global institution for Krishna consciousness, establish 108 temples all over the world and initiate some truly gargantuan temple construction projects. 3. There will be no need to accept 10 000 plus disciples. 4. There will be no absolute need for someone to travel 15 times around the world, lecturing twice a day and meeting news reporters, scientists, religious leaders, politicians and world renowned dignitaries and celebrities. 5. There will be no need for someone to become the topmost Bhakti-Vedantist, able to quote innumerable Sanskrit verses at a moment’s notice. 6. 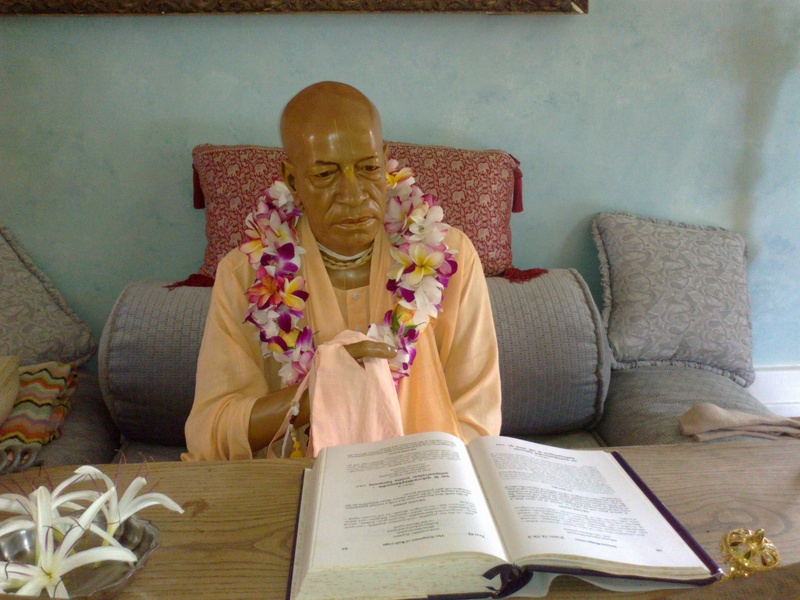 There will be no need for someone to publish 80 plus spiritual books, compose 6341 personal letters and establish a Bhaktivedanta Book Trust to publish them. 7. There will be no need for someone to create the world’s first vegetarian restaurant chain and introduce the Rathayatra festivals in major cities of the world, thus bringing the temple to the people. 8. And finally, provided we could go back in time, there will be no need for someone to start a monthly magazine called Back to Godhead on the 1944 appearance day of Om Vishnupada Bhaktisidhanta Saraswati Maharaja. It is not even compulsory to get up at one AM daily, if one is not so endowed. 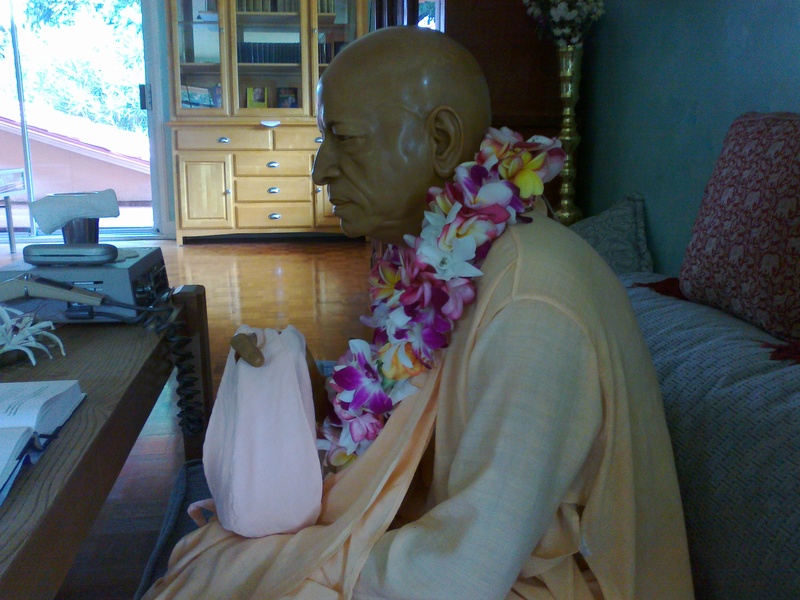 But you will admit that it will indeed be a nice achievement in Srila Prabhupada’s footsteps and the footsteps of the other Goswamis. Out of his great expertise, compassion and kindness, His Divine Grace A.C. Bhaktivedanta Swami Prabhupada, Lord Caitanya’s sena pati, has already accomplished all the above and much more for your personal benefit also. dancing and feasting. End of prayer. Srila Prabhupada, I am happy to report that due to your mercy conjugated with my feeble efforts, Krishna consciousness has become manifest to some extent in my heart. Even if I were to try, I would be unable to extinguish it, just like it is difficult to suppress a forest fire in favorable circumstance, as we often experience in Australian summers. Somehow or other it reappears again and again. That seems to prove your postulate that Krishna consciousness is the common innermost energy and essence of all living entities. Krishna consciousness is the true golden path of self-realization. Funny thing is that when I was an altar boy and sacristan, the liturgy was in foreign language i. e. Latin. Now it still is in foreign language i.e. Sanskrit. Why did I take birth in the wrong culture? Under Krishna’s direct guidance, You created these transcendental law books in the early hours of the morning and our part is to research Your books in the early hours of the morning or at any other time of the day. You are chanting (kirtanam) and we are hearing (sravanam). These are the first two angas of devotional service as enunciated by Mahajana Prahlada in SB 7.5.23. Whenever someone is chanting someone will hear, if only the chanter himself. Srila Prabhupada, You are so kind and attentive that You will not allow us even for a moment to be overcome by the bodily concept of life. Because the qualities of the modes of material nature are mentioned therein, we may meditate on BGAII 3.5 by contemplating our bodily restlessness. But in the very first sentence of the purport You immediately cut in and wake us up by stating that it is the soul who is always active and that the body is actually dead. Let us first of all show full, all round respect where it is most due, that is in our relationship with Krishna’s representative, You, Srila Prabhupada. Then we shall automatically be respected also. In a totally different context, I have witnessed how one young lady-disciple of HH Indradyumna Maharaja, and author as well, expressed on his birthday celebration her attachment and affection for her spiritual master and how she called him “her father”. I feel I am respectively in the same position. You have created a wonderful and unique family wherein we can grow and cultivate spiritual relationships. Out of all human beings, I have met physically or through their writings, I find your association most enriching, your style most endearing! You are the perfect master, PhD and post graduate in the Science of Krishna consciousness, the king of education and most confidential knowledge as well. Your company is never boring. It is always a new and fresh adventure. You explain that there are different Sanskrit terms for friend, out of all these nomenclatures, “suhrit” means the best friend because he has our own best interest in his heart at all times. Su means very good, very favorable and hrit means heart. You are truly suhrit, our ever well-wisher, not only for your direct spiritual descendants but also for the whole of mankind. You are not sentimental though and if tough love is required, as Prime Minister Abbot calls it here in Australia, you will use it. In one sense your whole program of Krishna conscious education is a program of tough love because the path of Krishna consciousness is not easy when it is practiced according to the guidelines of Shastra. This you have explained in BGAII 7.3 purport: “Although nondevotees declare that the path of bhakti, or devotional service, is very easy, they cannot practice it. If the path of bhakti is so easy, as the nondevotee class of men proclaim, then why do they take up the difficult path? Actually the path of bhakti is not easy. The so-called path of bhakti practiced by unauthorized persons without knowledge of bhakti may be easy, but when it is practiced factually according to the rules and regulations, the speculative scholars and philosophers fall away from the path”. But what valuable things in life come easily? Krishna consciousness surely IS the most valuable thing, even more valuable than touchstone, as Srila Sanatana Goswami has exemplified! “…. we are not concerned to hear any rascal. We want to hear Krishna. We are not prepared to hear any rascal, so-called scientists and so-called philosopher, so-called God. No. We are not prepared. Because everyone is rascal. Everyone is full of mistakes, everyone is trying to cheat others, everyone is illusioned, and everyone’s senses are imperfect. How he can give knowledge perfect? That is not possible. Thank you very much, Srila Prabhupada, for showering the nectar of Krishna consciousness upon us. May my ability to taste it never wane. May my ability to taste it ever increase exponentially instead. We acknowledge unhesitatingly your vast superiority and gladly offer our prostrated obeisances again and again at your holy lotus feet. Jai Srila Prabhupada! All glories to you!